My husband and I are one of those weird couples that actually prefer to do everything together. Even when we don't agree on the activity, we often remain in each other's company. There's no reason I can't bring Heartland into the kitchen where he is doing the dishes. And while I bring zero knowledge to Gotham city, I will chat his ear off while he unlocks the secrets to Batman's quest. So it gets kinda lonely when he has to travel for work. I occupy myself with the usual suspects: sewing, baking, Netflix, oh, and watching the kids. But this time I even cleared out the fridge: a task I traditionally supervise only. 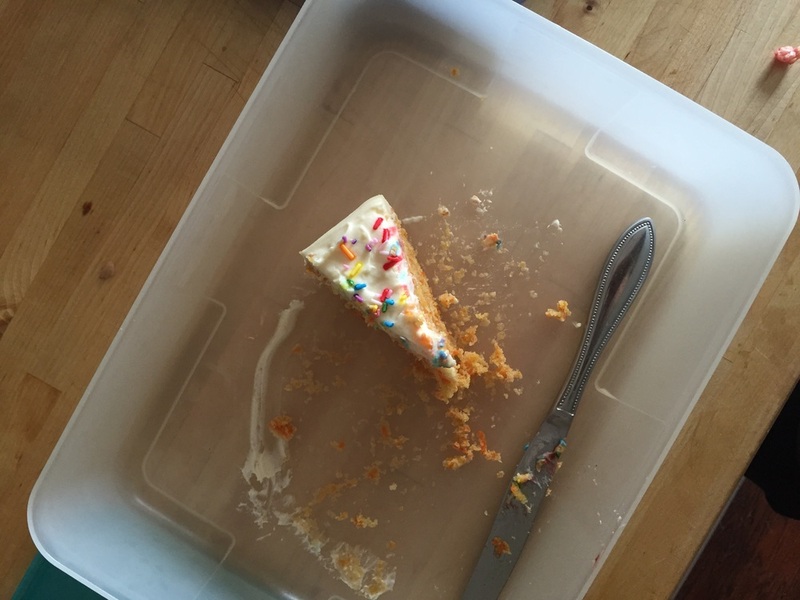 As if to reward me, I found a lonely piece of carrot cake that Dustin had not yet eaten. This is a big deal. It could not have been a mistake. He declared aloud how awesome this cake is (he is not a vocal man). Clearly, he loves me more. Adapted from Alton Brown's "18 carrot cake", this recipe makes the perfect not-too-dense carrot cake that has a lovely added scent from the coconut oil. As with all of Alton's recipes, some ingredients are measured in weight rather than volume -- it's actually easier this way! Go get a scale. You'll agree, too. Preheat oven to 350 degrees F. Prepare two 9" round cake pans with parchment paper. In the bowl of an electric mixer, beat together yogurt, vanilla, sugar and eggs. With the mixer on medium, slowly pour in the coconut oil and mix until well combined. Unless your wet ingredients were at a warm room temperature, the coconut oil will harden. Ensure the mixture is well beaten before stopping the mixer. In another large bowl, combine flour, baking powder, baking soda, cinnamon and salt. Add grated carrots and roughly mix with a spatula until the carrots don't stick together. Combine the carrot mixture into the wet mixture in three batches, mixing well between each addition. Pour the batter into the pans and spread evenly. It will appear to be quite thin, but will rise nicely in the oven. Bake for 20 minutes or until a poked skewer comes out clean. Remove from oven and allow to cool for 15 minutes. Turn the cakes out onto a rack to cool completely before icing (recipe below). If you are not icing until later, wrap the cakes in plastic wrap and store in the fridge or freezer. Recipe from Alton Brown's "I'm just here for more food"
Using an electric mixer with the paddle attachment, beat the butter and cream cheese together until smooth. Add the vanilla and mix until incorporated. With the mixer on low, add the icing sugar in four batches, scraping the sides of the bowl with a spatula after each addition. Refrigerate the frosting for 10 minutes before icing the cake. There should be plenty of frosting for a two-layer 9" cake.